LONDON (AP) — Britain’s Brexit drama went into overtime Wednesday as Prime Minister Theresa May and the country’s main opposition sought a compromise deal to prevent an abrupt British departure from the European Union at the end of next week. 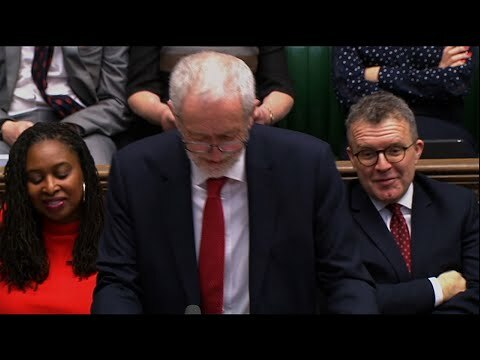 In an about-face that left pro-Brexit members of May’s Conservative Party howling with outrage, the prime minister sought to forge an agreement with left-wing Labour Party leader Jeremy Corbyn after failing three times to win Parliament’s backing for her Brexit deal. May also said she would ask the EU for a further delay to Britain’s departure date — postponed once already — to avert a chaotic and economically damaging no-deal Brexit on April 12. Skeptical lawmakers, reluctant to take her word for it, approved a hastily crafted law that compels May to ask for an extension to the Brexit deadline if a no-deal departure is looming. After lawmakers three times rejected an agreement struck between the bloc and May late last year, the leaders of the EU’s 27 remaining countries postponed the original March 29 Brexit date and gave the U.K. until April 12 to approve the divorce deal or come up with a new one. May’s pivot toward Labour points Britain toward a softer Brexit than the one she has championed since British voters decided in June 2016 to leave the EU. Labour wants the U.K. to remain in the EU’s customs union — a trading area that sets common tariffs on imports to the bloc while allowing free trade in goods moving between member states. Meanwhile, pro-EU lawmakers were not banking on talks between May and Corbyn succeeding. The House of Commons on Wednesday approved a bill to ensure May can’t go back on her promise to seek a delay to Brexit rather than let Britain tumble out of the bloc. The bill, debated and approved in a single day, compels May to seek to extend the Brexit process beyond April 12 in order to prevent a no-deal departure. In a reflection of how divided lawmakers are over Brexit, it passed by a single vote, 313-312. The bill still needs approval from the House of Lords, Parliament’s unelected upper chamber — likely on Thursday. And it does not force the EU to agree to delay Brexit. Casert reported from Brussels. Associated Press writers Danica Kirka in London and Geir Moulson in Berlin contributed.